Proden PlaqueOff has been clinically proven to reduce and help prevent plaque and tartar. It is estimated 85% of dogs and 70% of cats over 3 years show signs of gum disease, the major cause of tooth loss. Gum disease is caused by the accumulation of plaque bacteria and is converted to calculus by the minerals naturally occurring in saliva. If gum disease is left untreated, it can lead to bad breath, pain, tooth loss and other health problems. 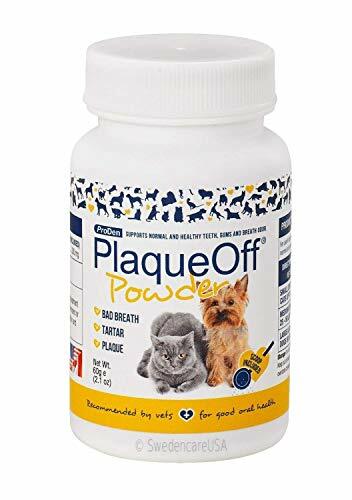 By using Proden PlaqueOff, owners of dogs and cats can take a simple and effective step towards the animal's oral health. Dental care is unfortunately one of the most overlooked health issues pet owners are concerned with As in humans, plaque bacteria constantly form in the mouth of all cats and dogs. Once plaque has calcified into tartar it can no longer be brushed off with a toothbrush. In many cases it has to be removed by a vet, using ultrasound and anaesthetic. If tartar build-up is left untreated it can result in bad breath, gum disease, tooth decay and premature tooth loss. Tartar that is allowed to remain for too long can also cause infections that can spread throughout the body and damage the heart, lung and liver and negatively affect kidney functions. ProDen PlaqueOff® Powder provides an easy complement to ordinary oral hygiene This product is 100% natural sustainably harvested sea kelp, harvested along the North Atlantic coast. The 100% all natural product, ProDen PlaqueOff® Powder is free from additives and artificial preservatives and contains no gluten or added sugar. Proden plaqueoff animal is an easy way for those dog and cat owners to care for their pet's teeth who don't have the patience or inclination to brush their dog or cat's teeth regularly. The product comes in powdered form and it is simply added on a daily basis to dry or wet food. Dogs and cats like the taste of the small amount that is added. Proden plaqueoff animal does not rely on topical application or friction. The product is ingested and works systemically. The natural compound in the product comes out through the saliva and works to break down the bacterial biofilm that forms on the teeth and gums. This is how the natural bacteria in the mouth take hold onto the teeth and gums, colonizing and creating the oral problems of plaque and tartar, bad breathe and gingivitis. It does not change the ph of the mouth or kill off the normal levels of bacteria. Proden plaqueoff has been proven to reduce plaque and tartar on the teeth and gums, depending on composition, diet and how long it has been there. It then works to prevent bad breath, plaque and tartar from returning. Patients generally begin to see results over a 2-8 week period, and will see further benefits with continued use. Proden plaqueoff animal is made from a specific strain of selected seaweed harvested from above scandinavia. This seaweed has developed a natural defensive mechanism against bacterial biofilm. The product is made only from this seaweed and has no additives or chemicals added. It is human grade and human tested. 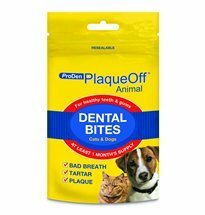 ProDen PlaqueOff animal is an easy way for those dog and cat owners to care for their pet's teeth who don't have the patience or inclination to brush their dog or cat's teeth regularly. The product comes in powdered form and it is simply added on a daily basis to dry or wet food. Dogs and cats like the taste of the small amount that is added. Proden plaqueoff animal does not rely on topical application or friction. The product is ingested and works systemically. Additional Information The natural compound in the product comes out through the saliva and works to break down the bacterial biofilm that forms on the teeth and gums. This is how the natural bacteria in the mouth take hold onto the teeth and gums, colonizing and creating the oral problems of plaque and tartar, bad breathe and gingivitis. It does not change the ph of the mouth or kill off the normal levels of bacteria. Proden plaqueoff has been proven to reduce plaque and tartar on the teeth and gums, depending on composition, diet and how long it has been there. It then works to prevent bad breath, plaque and tartar from returning. Patients generally begin to see results over a 2-8 week period, and will see further benefits with continued use. Proden plaqueoff animal is made from a specific strain of selected seaweed harvested from above scandinavia. This seaweed has developed a natural defensive mechanism against bacterial biofilm. The product is made only from this seaweed and has no additives or chemicals added. It is human grade and human tested. From the Manufacturer Pro Sense Breath Tabs work to safely and effectively maintain your pet's oral health. These easy-to-administer chews encourage natural chewing action to help reduce tartar build-up and feature a tasty mint-flavor that dogs love. Product Description Pro Sense Breath Tabs work to safely and effectively maintain your pet's oral health. These easy-to-administer chews encourage natural chewing action to help reduce tartar build-up and feature a tasty mint-flavor that dogs love. Have you ever wondered what your dog is thinking? Meet one funny dog--Enzo, the lovable mutt who tells this story. Enzo knows he is different from other dogs: most dogs love to chase cars, but Enzo longs to race them. He learns about racing and the world around him by watching TV and by listening to the words of his best friend, Denny, an up-and-coming race car driver, and his daughter, Zoë, his constant companion. Enzo finds that life is just like being on the racetrack--it isn't simply about going fast. And, applying the rules of racing to his world, Enzo takes on his family's challenges and emerges a hero. In the end, Enzo holds in his heart the dream that Denny will go on to be a racing champion with his daughter by his side. For theirs is an extraordinary friendship--one that reminds us all to celebrate the triumph of the human (and canine) spirit. This is a special adaptation for young people of the acclaimed New York Times bestselling adult novel The Art of Racing in the Rain. Clenz-a-dent ProDen PlaqueOff Oral Health Flakes contain purifed Ascophyllum Nodosum, a seaweed extract which helps maintain clean teeth and fresh breath. Clenz-a-dent ProDen PlaqueOff Oral Health Flakes are additive-free, preservative-free, sugar-free, gluten-free and rich in natural iodine. Clenz-A-Dent ProDen Plaque Off Food Additive gives pet owners a natural, easy way to keep their pet?s teeth clean and healthy. Just sprinkle a dose on your cat or dog?s food once a day. 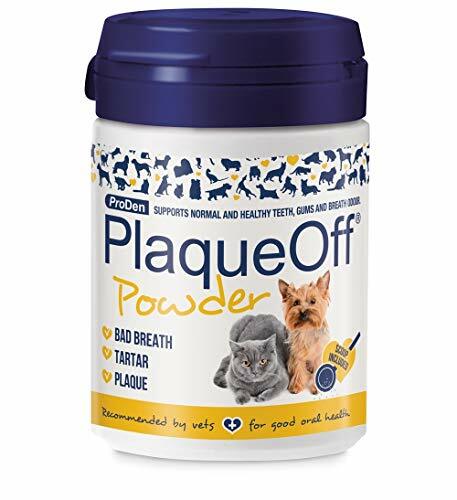 Controls plaque and tartar build up in cats and dogs Freshens breath See results in as little as 3 weeks Powder formula mixes with food Using Clenz-A-Dent ProDen Plaque Off Food Additive is like cleaning your pet?s teeth while they eat. This effective food additive contains a seaweed, called Ascophyllum nodosum, which naturally inhibits the formation of plaque, calculus, and tartar on the teeth and gums of dogs and cats. Clenz-A-Dent ProDen Plaque Off also freshens breath. You should see results in 3-8 weeks. Just sprinkle Clenz-A-Dent ProDen Plaque Off on your pet?s food once a day ? the palatable powder mixes well with dry or wet food. This powder can be used in conjunction with other Clenz-A-Dent products for effective home dental care. Note: this product should not be given to animals suffering from hyperthyroidism. Our Salmon flavored gel removes plaque and tartar from your pet's teeth-no toothbrush required. Made with all-natural, holistic ingredients, oral care Gel safely removes plaque and tartar, reverses oral disease, promotes healthy gums, brightens teeth and kills the bacteria that causes bad breath. The ingredients mix with your pet's saliva when applied on your pet's teeth and completely coats your pet's teeth and mouth. This process kills harmful bacteria and loosens plaque and tarter. 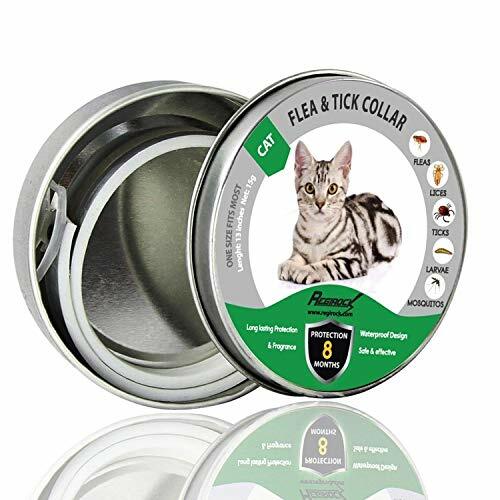 Safe for cats and dogs of all breeds. Start your pet on the road to better oral health today. Made in the USA. The contributors to this volume include scholars and financial analysts. Their data, means of analysis and policy insights should be a useful source for future research and educational improvements. Going beyond mere juxtaposition, the editors show how chief ideas represented in the chapters relate to one another and have developed over the last few decades. Plaque off dental bites are very unique as they stick to the teeth and soften the tartar deposits. They do state you can start to see an improvement within week three of use. They are easy to give in a treat size and you pet will enjoy eating these as well as you not having a dog with unpleasent teeth or breath. Late in the twenty-second century while attempting to rescue a long-lost spaceship in the outer reaches of the galaxy, the explorer craft Palomino is swept into a timeless, bottomless black hole. Pages are removable for use as posters.